The Berlin Wall (German: Berliner Mauer) was a wall that separated the city of Berlin in Germany from 1961 to 1989. It separated the eastern half from the western half. Many people thought it was a symbol of the Cold War. The Berlin Wall was taken down on November 9, 1989. The Berlin Wall was about 168 km (104 miles) long. It was built to prevent people from escaping from the eastern half of Berlin. 4 Tear down this wall! After Germany split into West and East Germany on May 8,1949, 2.6 million East Germans left to go to West Germany. In Berlin alone, 3.6 million people fled to the west. 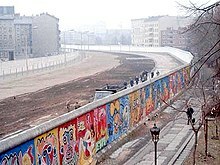 To stop this, on August 13, 1961, the Communist government of East Germany built a wall separating East and West Berlin. "Tear down this wall!" was a speech made by United States President Ronald Reagan to Soviet Union leader Mikhail Gorbachev to destroy the wall. The speech was made at the Brandenburg Gate near the Berlin Wall on June 12, 1987. It was made to honor the 750th anniversary of Berlin. His speech and its fallout might have aided in the wall's demolition. ↑ The exact number is not known. It is hard to say as the authorities of the GDR did not report the deaths clearly. ↑ "E German 'licence to kill' found". BBC. 12 August 2007. Retrieved 2007-08-12. A newly discovered order is the firmest evidence yet that the communist regime gave explicit shoot-to-kill orders, says Germany's director of Stasi files. This page was last changed on 1 October 2018, at 03:16.